Back to my page "Sailing"
Some of the books mentioned below are only available in German. A list of often used technical terms (English-German) can be found in: My small sailing dictionary. It can help to understand the German and English books alike. H. G. Hasler and his co-writer describe both their experience and several construction details and varieties. They might help you to avoid mistakes, needless costs when buying, rebuilding or constructing such a boat. The book is pretty expensive but it is worth every single Dollar or Pound. One kind of rig, only very few varieties, few justifications but many practical advice and tipps. He even describes the construction of a mast made of one log. 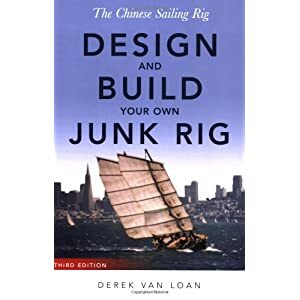 Whoever will have read "The Chinese Sailing Rig: Design and build your own junk rig" (Amazon.co.uk / Amazon.com) will soon be looking for the adecuate hull. This book is only available in English. Along with 'Practical Junk Rig' it is super. 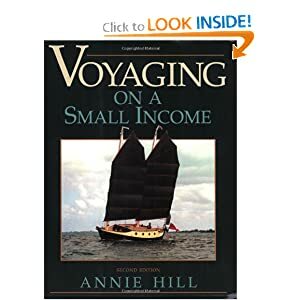 In her book 'Voyaging on a Small Income, 2nd Edition' (Amazon.co.uk / Amazon.com) Annie Hill describes how it is possible to spend several years on board a ship with only very little money. She provides many practical tipps for the life on board. Due to the fact that the junk sails only provoke low costs and are easy to deal with, they equipped their two-masted-ship 'Badger' with junk rigs. In the book you also find several drawings about 'Badger' and many similar boats. In her Blog she tells us, how the sloop "Joshua" became "Fantail" with junk rig. Meanwhile, Annie Hill lives together with Trevor Robertson on board of the steel gaff cutter Iron Bark. 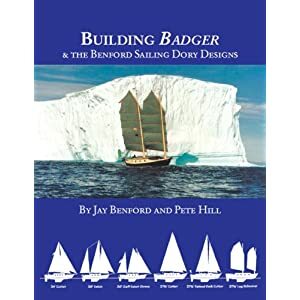 In the book 'Building Badger & the Benford Sailing Dory Designs' (Amazon.co.uk / Amazon.com) Jay Benford and Pete Hill (Ownwer of Badger) describe the conception, design and construction of Badger and similar twin keel Dories. 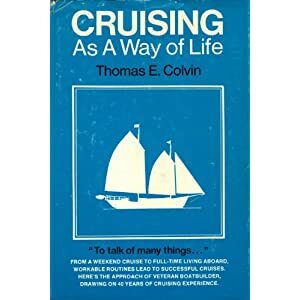 Similar to Annie Hill, Thomas E. Colvin, talks about what is required for a life on board a ship. He restricts himself rather on the technique and organizational things. Moreover, he describes his three masted junk "Kung Fu-tse". 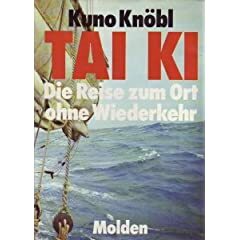 Die Dschunke: Vagabunden auf der Seidenstrasse des Meeres describes the voyage of Axel Brümmer and Peter Glöckner on board their two junks Kublai's Khan and Kublai's Kahn II from Asia to the Baltic Sea. The book is available only in German. Traugott Malzan: Blaue Küste, rote Segel. Mit der Dschunke im Mittelmeer (Blue coast red sails. With a junk in the Mediterranean Sea). It is a report about the journeys starting at Port Grimaud, along the French Mediterranean Coast; from one small bay to the next. His ship "Mandarin" is a junk imported from Hong Kong. One part of the book talks about the experience with the 22-tons-junk "Sheung She" (also starting at Port Grimaud). In their book 'Sailing Back in Time' (Amazon.co.uk / Amazon.com) Maria Coffey and Dag Goering, who are known among canoeists, report on their nostalgic journey in two ships along the coast of Western Canada and its world of islands and fiords: Allen Farrell's three masted ship China Cloud as well as an single masted boat, both equipped with junk rigs. TAI KI. Die Reise zum Ort ohne Wiederkehr. (Tai Ki: To the Point of No Return). Kuno Knöbl writes about his trip from China to the USA with a copied chinese junk. Building the three masted „Liberdade“ with junk sails and sailing her from Rio de Janeiro nach Washington D.C. in 1887(!). More than 100 yaers ago but still very interesting. From 1895 until 1898: The first solo circumnavigation of the earth. Or you may send an email to your friends. Ursula Rothermann and Wolfgang Hauf describe their ship "Prüveda" as well as its restoration. Very detailed. The best homepage which has been written on the „junk rig nowadays“ in German and English language. Of course, they also comment on where they have already been to with their boat: North Sea, Baltic Sea, through Dutch and German inland-waterways, the River Danube and the Black Sea to the Mediterranean Sea. The sailmaker Tuchwerkstatt in Greifswald owns "Peregrine". Her owner had been in Norway and Sweden with her. After winning the German HanseHanse-Sail (in the Class of one masted traditional ships) he is in Norway again. Mike Perrin and Pat Whittaker have started their journey in 2007 and since then are sailing around the globe with their 39' two masted El Lobo. Susanne and Thomas Mallunat have sailed their two masted catamaran AORAI since 2008: They started in Berlin, crossed the Canaries and Caribbean, headed for Canada and its huge lakes and back again. This page also includes Videos. The hulk is a construction of James Wharram (see below). At aorai.de you can read about AORAI’s previous journeys (back then still with cutter rig). Shirley Carter is singleahanded on her way with her ship "Speedwell of Hong Kong". Bertrand Fercot and his wife also own a Wharram-Katamaran, PHA, with two masts and they are building another Wharram. The rig appears similar to a junk sail; but there are Wishbone booms attached to the mast and clothed with fabric on both sides (swing wing rig). Note: These links might not work with older versions of InternetExplorer (= version 6) – at least on one of my computers they don’t. Tim Padfield describes on two pages how he successfully attached a junk sail to his Folding Kayak 'Klepper Aerius 2000'. I am planning to do the same with our 'Klepper Aerius II' but I want to use the original Klepper leeboards or something like that. Chris Bray and Jess Taunton want to sail the NW Passage with their "Teleport". Alan and Lisa MacBride are building the 26' heavy displacement one mastetd junk "Albatross". Before that he built Puffin. Here you find a junk sail for a canoe. Mike Spring describes his ride on his 21 foot boat "Coromandel" to the Azores and back again. He is severely physically handicapped. This single handed was only possible because of the easily and safely handeled junk sail. In 2003 Axel Brümmer and Peter Glöckner undertook trips (from Goa/India towards Hongkong) with one of the last existing seagoing chinese junks, 'Kublai's Kahn' (three masts). A heavy cyclone sank them in May 2003 close to Singapoore. After the sinking of this junk an Indonesian Pinisi was converted into 'Kublai's Kahn II' (four masts). Her journey led from Indonesia to China, from there to Germany, then to Brazil and now (2008) back to China. In Kiel there was a 'Atropos' with two masts built in 2006. Clive Hamman is on the way around the world with "Nuthin Wong". The "Mau Yee" was built in Hongkong in 1962 and brought across the Indian Ocean into the Adria, where she is still sailing today. It’s possible to join a sailing trip. Ride with a three masted historical junk from Hongkong to Oman. Paul and Gayle are en route with „Indigo" in the Pacific. 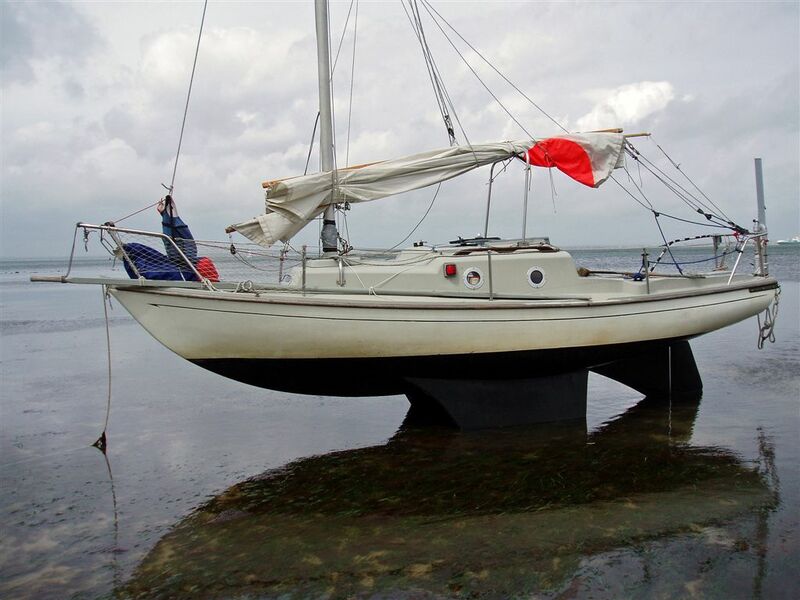 Finding Beauty in a Junk - Michelle Potter reports in a forum about her boat 'Moondancer'. In addition: The boat is a sister ship of 'Badger', see Annie Hill’s book: Voyaging on a Small Income. 'Vino Tinto', annother a sister ship of 'Badger'. Here De Clarke presents photos of his TAZ. She is a replica of Allen Farrell’s China Cloud, see the book 'Sailing back in Time'). In his blog De Clarke reports what is presently being reconverted (2008). This page also contains a lot of interesting photographies of other ships with junk sails. Construction and building of the Sailboat "RV SEEKER". Karl and Joan Cunningham are on there way with "KALA-D" between the Virgin Islands. Roger Taylor undertook 2 journeys around GB, towards the Amazores and to the polar circle with his own converted Corribee 21 (bilge keel), MINGMING. with his "Candice-Marie", a Trident 24, Thomas Hau wants to take part in the Jester Challenge from Plymouth (GB) to Newport (USA) in 2014.
corribee.org [en] The shared page of the Corribee owners with "for sale and wanted". Clay Everington depicts 2 Atlantic crossings with 'Rabbit' a Kingfisher 26' in 2001/2002. A Kingfisher 20' JR - the only 20' boat of which one model was designed and produced with a junk rig. You will find one of them ("Mimpi") in Greifswald Germany. Kingfisher Yacht Owners Association. A lot of information on Kingfisher yachts with and withot junk rig. A blog about building and sailing the 36 feet 'Linnea' (one mast with junk sail). In this Artikel "Dragon Wings" Gary Lepak describes his catamaran PUFF (the magic dragon), which has 2 masts with junk sails. In an other Article you can read about How to Make a High Performance Polytarp Junk Rig More ideas about polytarp sails: polysail.com and google with "polytarp". Diy Wood Boat sells materials for building and repairing wooden boats. 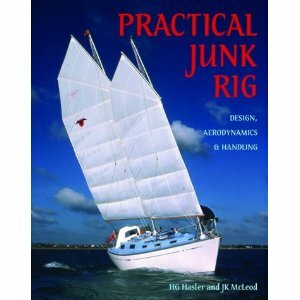 They also provide informations about the basics of junk rigs and how to convert a bermuda rig to a junk rig. And you find detailed information about the junk rig of the restored Migonne. Here you can read about the experiences with 'Joleta' (one mast, about 37 m² sail area). James Wharram builds seaworthy catamarans in Indonesian style and even offers construction plans. His hulls can be combined with all kind of sails. Ideas for ‚something tiny‘: It is not too difficult to build your own little sailing dinghy togther with a little trailer. And you can even agglutinate a sail. 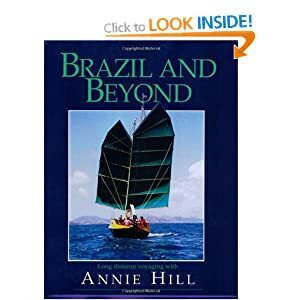 Here you do not only find interesting reports but also a list of books, that you could /should take on your journey (Annie Hill‘ is one of them). A sixteen-foot Scaffie is converted to a junk rig. Collction of Links on junk rigs. One of the few french sites on junk rigs. KAN AVEL with a junk sail: Gybe 1, Gybe 2 this actually looks more like a accidental gybe. reefed and with 5,2 kn, beam reach 1 - 2 Bft. Many videos by Roger Taylor and his MINGMING. 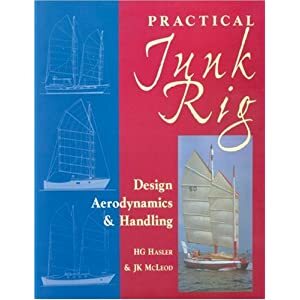 Junk rig association with their own technical magazine (4 editions per year) with reportages, technical reports, experiences and forums concerning junk rigs. This is a newsgroup at yahoo discussing the design and construction of boats with a junk sail. One oft he most famous boats with a junk sail is Blondie Hasler’s Folkeboat Jester, that crossed the Atlantic several times. In remembrance every two years the single handed Jester Challenge is taking place – for boats with a length of 20' to 30'. Little organization and rules, no officialism, no prize, just for fun. Even a junk sail is not mandatory. In 2008 there will be a Jester Challenge from Plymouth to Ponta Delgada (the Azores). Bootsbau Weiß in Peenemünde is specialized on wooden ships and has already rerigged several ships with junk sails. The sail factory Tuchwerkstatt is located on the compound of the Greifswalder Museumswerft e.V. near the Hanse Yachts Werft. There they produce customized sails: anything from regatta sails to traditional sails. On demand they also produce junk sails. With profiled sail panels and up-to-date materials, excellent results can be achieved sailing oby the wind. On this they have some experiences with their own Peregrine. Bruce Roberts sells do-it-yourself construction plans, books and DVDs to build various motor and sailing boats, among them some with junk sails. In his factory in Exeter Christopher Scanes manufactures sails of all kinds and has increasing know-how concerning junk sails, and how to cut them for modern ships. Producer of sails of all kinds. They produced the sails for Jester. According to several statements the globally leading specialist for design, construction and reparation of unstayed masts masts and junk rigs. There are always some boats for sale. Many boats for sale; thorough illustration (up to 70 photographies per boat). Kasten Marine Design offers many do-it-yourself construction plans. On the website What About The Junk Rig you find junk sails described and in addition the 48' schooner Jasmine. Hydrovane, the wind vane selfsteering, that is also used on board of El Lobo and Prüveda. Wind vane selfsteering by Peter Christian Foerthmann. Tiller Publishing provides a lot of books on planning, building and sailing of boats. Was man dabei beachten muss, und welche Steuertipps es in dieser Situation gibt, wird auf dieser Seite beschrieben. WhWhooever wants to make a round-the-world-trip or wants to stop working in Germany for another reason needs to temporarily say good bye to the local tax office. This page gives Germans some tips concerning taxes and other important things that need to be considered in this situation. The Danish port guide online. Articles by Wikipedia: Junk (Ship) [en], Junk Rig [en], Dschunke [de], Dschunkensegel [de]. Last not least: The German Association to Save Castaways. (Die Deutsche Gesellschaft zur Rettung Schiffbrüchiger DGzRS). It is only financed by donations! And: May there always be a hand’s breadth of water beneath your keel!